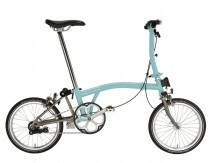 A Brompton is the perfect bicycle for the city. It folds down to a portable, practical size so can be taken on other forms of public and private transport. It can also be taken inside (homes, offices, bars) so it is a lot less likely to be stolen. Its ride position and agility are more than a match for conventional bicycles. Small wheels mean fast acceleration from red lights and increased maneoverability through busy streets. It is tough and can take everything the city throws at it, every day. A steel frame, efficient and puncture resistant tyres, handmade with high build quality and a design that has been refined over 25 years means Brompton bikes provide years of regular city use and beyond.